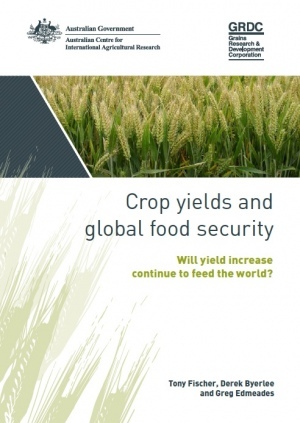 Yield gaps, trade liberalisation and biotechnology: three new reports on the way to tackle food insecurity – One Billion Hungry: Can We Feed the World? Addressing these yield gaps, authors say, will require a combination of plant breeding of higher yielding and more resilient varieties, public agricultural extension to train farmers in improved farming practices and greater integration between farmers, scientists and businesses. While examples of yield gaps being significantly closed do exist, particularly where new technologies are adopted and markets are reliable – the One Acre Fund being given as an example, the rural transformation required to help subsistence farmers in developing countries close the gap will require substantial investment that as yet is missing. The book also investigates how increasing crop yields will impact natural resources and the environment. On the whole the picture painted is a positive one with yield increases being linked to higher water use efficiency, nitrogen use efficiency and phosphorus use efficiency although over use of the latter two is prevalent. The publication states that “Sustainable intensification is the only realistic path for efficient cropping and greater food security”, emphasising the importance of integrated management while stating that promotion of organic farming is “misguided”. Overall the main threats intensive agriculture poses to the environment are the emission of nitrous oxide into the atmosphere and of nitrate into waterways. On the positive side sustainable intensification could have major land saving benefits. This book presents a detailed, comprehensive and balanced view of tackling food insecurity through increasing crop yields, one based on real examples and solid evidence. Keeping with the intensification theme, the International Food Policy Research Institute (IFPRI) and African Development Bank (AfDB) have authored a report entitled, GM agricultural technologies for Africa: A state of affairs, which explains that Africa must “embrace agricultural innovations to better compete in an evolving global bio-economy”. Biotechnology is noted for its importance in contributing to sustainable intensification and for addressing the barriers facing farmers in increasing production under conditions of resource scarcity and climate change. Although not endorsing a particular position on biotechnology but rather presenting evidence of its use in Africa, the report is positive on the contribution biotechnology, or more specifically GM, could have towards addressing poverty and food insecurity. Its adoption by most African countries, however has been limited to date, lagging behind Latin America and Asia. Of the 54 AfDB member countries only 3 are planting and commercialising GM crops – Burkina Faso, South Africa and Sudan. In other countries such as Ghana, Kenya, Malawi, Nigeria and Uganda GM research and regulatory developments indicate GM commercialisation may be forthcoming. The report provides collected published evidence about the benefits and constraints of the adoption of these technologies, such as limited financial, technical, regulatory, and legal capacities, and trade concerns. Suggested solutions to these constraints include “increasing public investments in agricultural biotechnology research and development; improving regulatory frameworks and regulatory capacity; and developing an effective and broad-based communications strategy”. What the report presents is a convincing case that for Africa to transform its historically low productivity agriculture and become globally competitive it must embrace new technology because this is the “global norm”, and that biotechnology is part of this modernisation. Unlike the first report mentioned in this blog, the negative consequences such a path of heavily technology-dependent economic growth will create are given little examination, as are the social, ecological and economic implications of biotechnology adoption. Their review of the data on biotechnology in Africa, they say, results in largely positive conclusions despite the fact that the data is scarce and patchy, and a lot of conclusions are based on research outside of Africa. In fact improving the quality of data is one of the recommendations of the report. Although little evidence of its contribution to reducing hunger is given, it does appear that biotechnology could play a role in closing yield gaps and adapting to resource and climate-related stresses. Current levels of investment, systems of regulation and capacity to innovate are particularly low and the report provides comprehensive and detailed recommendations for how these could be improved. One barrier to the adoption of GM in Africa commonly cited, is the worry that its adoption will reduce international trade with the EU. The report states that this should not prevent countries from adopting GM. “Research has shown that adoption of the current GM crops will be beneficial for African countries, despite perceived export risks.” Developing intra-regional trade in the continent is a priority as the large majority of food is imported from outside of Africa and this may become especially important if GM crops are adopted on a large-scale. Looking to global trade and its impact on food security is a new report by the Quaker United Nations Office, Trade Liberalisation and Food Security, which investigates whether opening up global agricultural markets will help tackle hunger. Despite agriculture employing over 30% of the world’s work force and providing incomes for 70% of the world’s poor, international agricultural trade is relatively small. “Agriculture accounts for just 9.2% of all merchandise trade.” While it may seem then that international agricultural trade policy would have little impact on food security, the reverse is true – trade policy and patterns have wide-reaching influence on such things as food prices and market opportunities. The liberalisation of agricultural markets has been pursued by some since the 1980s backed by the economic argument that more open global systems encourage gains in efficiency, higher food production levels and lower production costs, and thus food prices. Critics of liberalisation see that the opening up of global markets has left some developing countries vulnerable to higher international standards and of being outcompeted, liberalisation ultimately favouring the richer nations and those more able to take profitable risks. Protection of farmers, the food insecure and environment is argued by some of these critics to be important. This paper is quite unique in that it attempts to refrain from the typically ideological arguments for or against liberalisation but to empirically link trade regimes to food security. Overall the assumptions made about liberalisation and its impact on efficiency, competition and food security do not hold and liberalisation of markets has, on the whole, been negative for food security and developing country farmers. Whether this is as a result of liberalisation itself or of market failures is unclear. The author as opposed to siding with liberalisation or protection arguments proposes the integration of efficiency goals with social (or livelihood) goals in trade policy. “Under the right conditions, trade may provide some benefits for the world’s poorest countries and may play a role in contributing to food security, livelihoods and environmental protection. For this to happen, however, it must be guided by careful policy development under a rules framework that is flexible enough to allow each country the appropriate policy space to determine how best to balance a variety of social goals within their own unique context”. Three interesting reports linking food security to different dimensions – trade, technology and intensification, largely present evidence-based balanced arguments taking into consideration the complexity of food security and the need for integrated approaches. One things becomes clear when reading these reports though and that is the gap in evidence and data between the factors that influence food security and the nature of the relationship, the latter being often based on assumption. It seems unlikely that without a better understanding of the links between global trade, technology adoption and sustainable intensification and food security that we will be able to effectively reduce hunger but these reports are a vital step in highlighting the gap and in attempting to close it. More awareness creation on the modern farming techniques especially to rural poor and assist them to get the right kinds of seeds that fits their environment.